Ole’ Cottontop /Hawks Aloft Inc. Scaled Quail. Image by David Powell. I knew that I should be driving slowly on the back roads of P-J land, shorthand for pinyon-juniper, because of the myriad of small animals that just might decide to cross the road at the exact same time as my vehicle arrived. It’s happened to me before, even though I try my best to be alert to animals that have evolved over millions of years without the hazards wrought by high speed vehicles that have only been around for about 100. Once, a little House Wren inadvertently committed suicide by flying right into the side of my car. Another time, a Lesser Goldfinch crossed the road in front of my car, right at hood height. I picked tiny little, bright yellow feathers from my air filter after that, all that remained of a formerly vibrant songbird. Then, at night there are the rabbits! They sit quietly, nearly invisible, but as a car approaches, they run, first off the road and then right back onto the road, sometimes right beneath the wheels. But, there is one group of birds that I find particularly endearing, quail, and they also tend to hang out near back country roads. In New Mexico, the two most common species are the Scaled Quail and the Gambel’s Quail. Often, I’ll catch a glimpse of one individual, generally standing beneath the shade of a low shrub. When I see that one bird, I just KNOW to drive slow, because it is NEVER just one bird. Spooked by the car, the observed bird waits until I am almost upon it and then dashes across the road, followed by one, then another, and finally a whole covey of them, sometimes up to fifty strong. 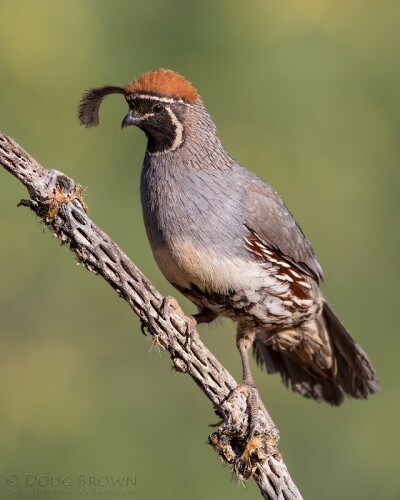 Gambel’s Quail have a curly top knot. Image by Doug Brown. Gambel’s Quail are the ones with the curly top knot, most common in the southern part of New Mexico. In our neck of the woods, we more often find their cousins, the Scaled Quail, also called Cottontop, so named for the distinctive white top-knot on its crest. They usually run from predators rather than fly, which is precisely why they are at greater risk of car strikes. Because Scaled Quail are usually seen running or flying away, folks often don’t get a chance to give them a good, once-over viewing, and to marvel at their buffy breast feathers, spectacularly edged with dark brown, giving them a lovely scalloped look. It’s one of those cases where nature achieved subtle perfection in design, since the scalies actually do blend in with their surroundings despite their elaborate plumage. Common in the lower elevations of New Mexico, they call to each other as they wander through brushy arroyos, cactus flats, sagebrush and pinyon-juniper woodland. They charming call, “pay-cos, pay-cos,” has become synonymous with the arid lands which they call home. Here, they wander along, picking up insects, seeds, and berries as they go, opportunistically foraging for whatever foods are available. They are often found around ranches, farms, and even on the outskirts of urban centers. They readily come to seed placed on the ground or in platform feeders positioned low to the ground, and have become a familiar and much loved back yard bird. However, their nests are extremely well hidden, often in dense, shaded vegetation, under brush piles, old machinery, and along fields, and very difficult to detect. Gambel’s Quail. Image by Doug Brown. Scaled and Gambel’s Quail populations cycle through “booms and busts” generally associated with drought years where low rainfall results in a lack of succulent foods. During these times, quail suffer widespread reproductive failure. 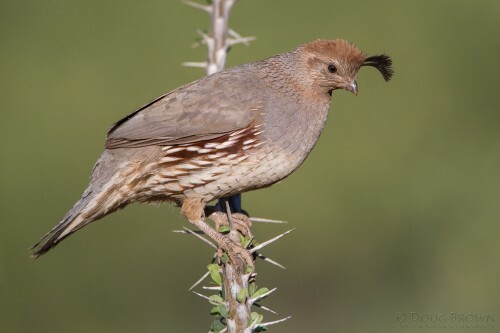 Succulent vegetation is especially important to quail during drought periods, as it is to other desert dwellers that must obtain their fluids from moisture in the plants they consume rather than water. Scaled Quail are a high priority species for many North American bird conservation initiatives due to long-term population declines. Although quail are game birds, hunting does not appear to be a factor in their decline. 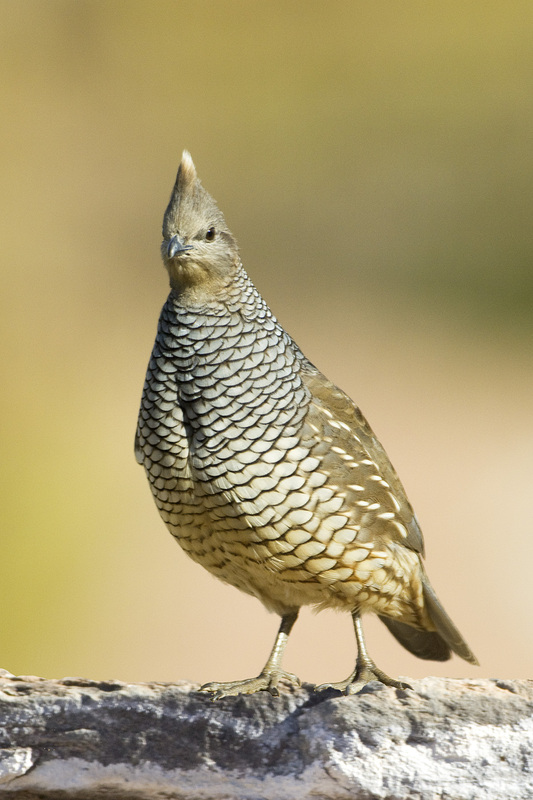 However, like many other upland game birds of the desert Southwest, they are particularly vulnerable to overgrazing by livestock, which has severely reduced feeding, nesting, and roosting cover in many areas. So, the next time you are meandering along a back country road, remember to give a bird a brake. If you take the time to stop, look, and listen, you just might be in for an eye-popping extravaganza, especially during the spring and summer when Mom and Dad Quail have little ones. They look like cotton balls on short, little legs as they race along behind their parents. Wait until the whole covey passes and then wait a tad longer. There’s often a straggler racing to catch up.